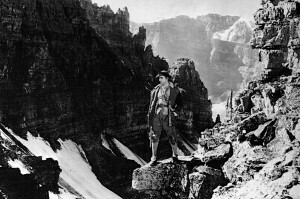 John Barrymore on Sentinel Pass during the filming of Eternal Love in 1928. The film was directed by Ernst Lubitsch and utilized some of the highest filming locations ever in Canada. It is only one of several Hollywood films with trail-accessible locations. Oscars time again and it always amazes me how Hollywood hoopla captivates the media, even here in Canada. And everyone seems to be looking for a connection, no matter how tenuous, to the glamour of the film industry. Of course, the Canadian Rockies aren’t exempt. More than 60 Hollywood-based films have been filmed at least partially in the region, and some scene locations can only be reached by hiking trail. Eternal Love (1929). Follow in the tracks of the legendary actor John Barrymore to some of the highest filming locations in Canada. 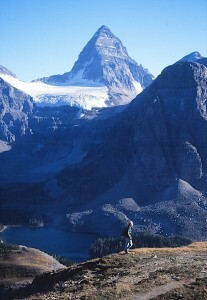 In addition to Sentinel Pass (see above), Barrymore and his leading lady Camilla Horn embraced on the summit of the Saddleback above Lake Louise with Mount Temple as a backdrop. Out of more than a dozen silent features made in the Canadian Rockies, it is the only one to survive intact. It was restored by the UCLA Film and Television Archive and released on DVD in 2001. Son of Lassie (1945). The second film in the popular Lassie series finds leading actor Peter Lawford running from German soldiers through much of Banff National Park (doubling for Norway) and was the first film to use the Columbia Icefield as a location. Hikers can follow the short trail to Stewart Canyon at Lake Minnewanka and stand on the bridge where Lawford (or his stunt double) leapt into the Cascade River with his dog Laddie in his arms. Trail guide co-author Bart Robinson follows in the footsteps of Anthony Hopkins and Alec Baldwin on the Nub Ridge trail a year after the release of The Edge. The Edge (1997). 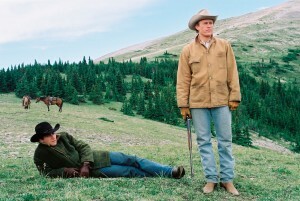 Director Lee Tamahori filmed nearly all of this love-triangle thriller in Banff National Park and Kananaskis Country. 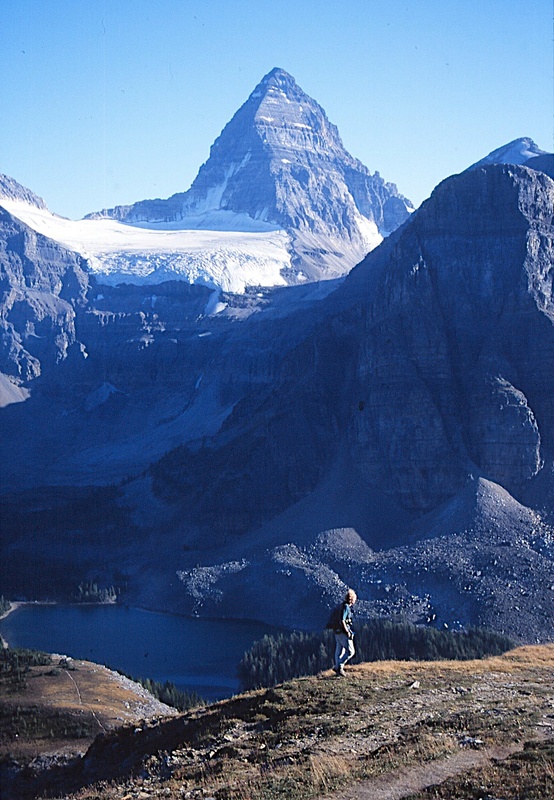 Lead actors Anthony Hopkins and Alec Baldwin bounced from one location to another throughout the parks, but their most spectacular setting was hiking on the alpine slopes of The Nub with Mount Assiniboine as a backdrop. Lead actors Jake Gyllenhaal and Heath Ledger on the slopes of Moose Mountain in 2004 during the filming of Brokeback Mountain. Brokeback Mountain (2005). This critically-acclaimed film used a variety of locations throughout Kananaskis Country, but one of the most scenic was on the slopes of Moose Mountain. The trail leading to Alberta’s highest fire lookout at the summit is a popular day hike, particularly in the spring when wildflowers cover the meadows. The movie won three Academy Awards including Best Director for Ang Lee. Photo credits: Top Brian Patton collection; middle Brian Patton photo; bottom Focus Features promotion still (click for larger images).